Water levels have risen and traffic has been hindered across the country as Macedonia in the past few days have been hit by steady rainfalls. 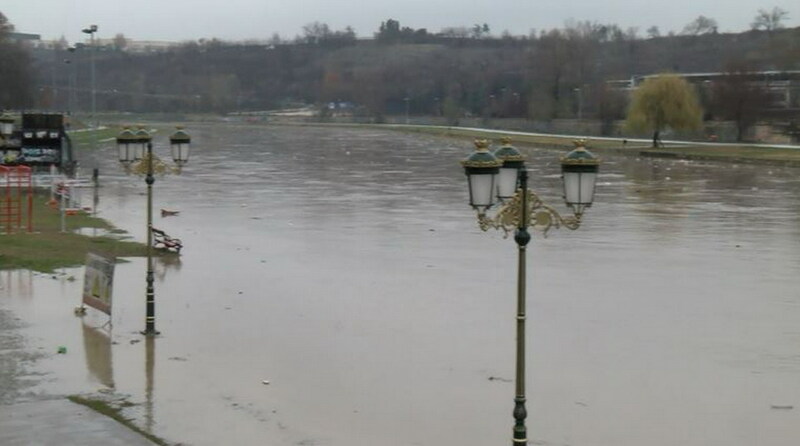 Exceptionally increased water levels of River Treska in western Macedonia were recorded Saturday morning with water levels now being higher by 50 cm compared to Friday, Macedonia's hydro-meteorological office says. Water levels of River Pcinja have also increased by 50 cm. Levels of River Borotinska have risen by more that 200 cm. Gauge height of River Vardar, which passes through the capital Skopje, is on the rise. Local showers are expected on Saturday, according to weather forecasters, thus suggesting gauge height of rivers will remain on the rise. Furthermore, heavy rainfalls and landslides have caused interruption of traffic on several roads across the country. Regional road Valandovo-Udovo village is closed completely since 01:00 a.m. due to water overflow. A local road near Demir Hisar is also closed. Also, traffic is hindered on the Delcevo-Makedonska Kamenica road due to heavy showers and frequent landslides. A landslide on Vinica-Berovo road has closed one lane, drivers are redirected on the other lane. Transport is hindered also on Mavrovo-Galicnik road due to water overflow. The Auto-Motto Association of Macedonia recommends that drivers should not use the road until it is repaired. An underpass in the municipality of Saraj in Skopje has been flooded.